Gates has the tough task of bridging two administrations. WASHINGTON (CNN) - Defense Secretary Robert Gates is learning that becoming the first defense secretary to bridge two administrations can lead to some awkward moments. 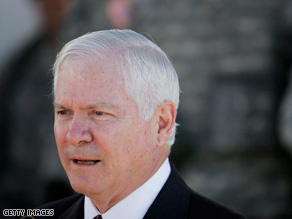 Last week, President-elect Obama announced that he would keep Gates on to run the Pentagon. He still answers to President Bush, since, as both President Bush and President-elect Obama have pointed out, "there's only one commander in chief at a time," Gates said. But he is not blind to the fact that his new boss and his transition team have demands too, which leads to "occasional awkwardness." Asked for an example, Gates said that at times he's had to choose between meeting with the transition team or meeting with members of the current administration. Apparently the incoming president's staff wins out over outgoing president's staff. "Let's just say that if I'm faced with a choice between attending a principals meeting on an issue that I think it not particularly hot, and a meeting with the transition folks, I'll opt for the latter," Gates said. But the current president doesn't have to worry about being ignored. "I'm not forgetting at all for a second who is the president until noon on January 20th," Gates said. "I haven't missed any meetings with the president, let me put it that way." Gates has had "several telephone calls" with the president-elect to talk about personnel to replace the outgoing political appointees, he told reporters traveling with him on a trip overseas. "We really haven't sat down yet for a thorough discussion of specific foreign policy issues, national security issues," Gates told the traveling reporters, according to a transcript. He's also met with Vice President-elect Joe Biden, who was in town Monday to meet with the defense secretary and the incoming nominee for Secretary of State, Hillary Clinton. Sorry, it's not that big a deal. It's on party and two names. The two party system is a ruse. Yawn...more of the same from these two corrupt parties. You democrats and republicans have screwed this country for years. Real change will come when someone comes to office that is not part of the Dems or Repubs. There is really little difference between these two parties. It's a shame that people don't recognize it. After years of dealing with Bush, meeting with Obama must be like stepping out of a dark closet into the light for Gates. First of all ,George Bush and his cronies must be tried for war crimes and if guilty pay the price before we could move on. If any one Dept. needs the most "change" it is Defense. This is where the wasteful spending is. This is where the bad decisions are made. This is the most convoluted bureaucracy of all the Federal entities. One that burns money on obsolete weaponry while its troops and veterans live in poverty. Yet Gates is the one goon from the "Iran/Contra, Star Wars, Mission Accomplished" crowd picked to still remain onboard. Now that's change for ya' ! Are you in a coma? Given the current situation in the middle east, I feel comforted in the fact that he's keeping Gates. I believe he will do what's best for the country, no matter who is President. At least McCain/Palin aren't in the inaugural position. If that were the case, this would truly be another Bridge to No Where. "sorry but Gates cant get Osama and unfortunately that is a strategic defeat. we'll never get him." Actually, we would have had him had W not blocked any further military action against him. His family financed Bush Sr's and Bush Jr's presidential campaigns and Bush Jr's failed oil company after all. "He should listen to Bush while he is President and screw Obama until Jan. 20." This would require Bush to actually do something. @Bush's Men: I call you and your ilk "floaters". Its bad enough that people voted for the current idiot-in-charge twice, and then went for the trifecta of failure by voting for McCain; many did it out of a sense of quiet partisan loyalty, others, astonishingly, really do think the paths laid out by rightwing [R]s are better for the country despite their obvious failures. But very few of these people actually dare try to defend in a public forum their votes and their support of such abject failure....it is a quite embarrasing task for most to argue for the obviously indefensible. So it takes an especially dysfunctional personality to "float" above the other neo-excrement and publicly display your vigorous ignorance by espousing rightwing lies and dogma as truth. You have much in common with the other "floaters" that exist in my cesspool. Post on you "floaters"...like your namesake you merely provide fertilizer.....fertilizer for the entertainment of the rest of us. As Shrub babbles incoherently about"winning in Iraq",just remember to look interested and nod accordingly. Who should Gates listen to? The idiot President, the sociopathic Vice-President, and the clueless SOS? That administration has already checked out. Bush is just hanging around long enough to unveil some portraits, pardon some of his favorite felons, and get his cleaning deposit back. In a hole with Cheney and Tom Delay? Hey, if you like Gates or not, you gotta admit that Rumsfeld is an easy act to follow. Anybody short of Gengis Khan would look good compared to a PNAC peon like Rummy. Even though I don't care too much for anyone willing to prosecute wars that we can't afford and that should never have been waged, I understand that the choice is still the president's, not mine. But thinking back to the campaign, and all of the garbage that white-haired old idiot from Arizona McCain spewed about winning with honor in Iraq... I just have to ask – what good is a victory if you bankrupt yourself doing it? Let Iraq fend for itself. Use American dollars in America, not Iraq, not Afghanistan, not Israel, but the United States of America. I am a Republican. It doesn't matter what Obama does, or says. He is guilty. If he were a white Republican, I would have voted for him. If he does well, I will credit Bush. If he does poorly, it will be because he is a Liberal Democrat. I will vote for Palin because she says really good words like Maverick. Anyone that chooses to be a part of his administration is either bad because they work for him, or good because they are Republican. Anyone whose name contains Hussein is a terrorist. I love guns, God and babies. No Liberal Terrorist Socialist can stop me from imposing my beliefs on them. Budwieser beer is good. I only drink American beer. Outsourcing is good. Drill here drill now. Amen.